結城タスク / YukiTask - A Simple Task Manager for Command Line Lovers. A Simple Task Manager for Command Line Lovers. YukiTask is a simple task manager. YukiTask is designed for those who love shell and command lines. Most scripts or templates are available in GitHub. Not enough tutorials or documents. 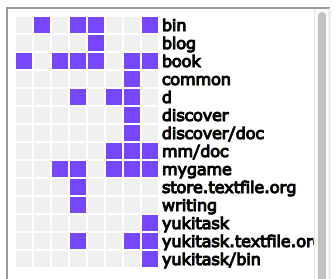 TODO: Write about what YukiTask is and is not. TODO: Write about philosophy of YukiTask: short commands using bash aliases, modifying makefile, automatic logging what you're doing everyday. TODO: Fix bug: difference between cloning and master.zip. TODO: Add feature: Edit aliases. TODO: Add feature: Uniq here. TODO: Add feature: Edit TODO with automatic detecting. [~] $ cd ~/work/book/tex          # Go to your directory. [~/work/book/tex] $ here book     # Register this directory as "book" project. [~/work/book/tex] $ cd            # You are working in other directory. [~] $ book                        # Just enter "book" command. Deadline: next week. # Automatically TODO is displayed. [~/work/book/tex] $ e             # Edit your current chapter with "e" command. [~/work/book/tex] $ mk            # Start LaTeXing with "mk" command. [~/work/book/tex] $ show          # Display the PDF with "show" command. [~/work/book/tex] $ bk            # And "bk" command for backup the whole directory.